62 games down, 2 to go. And the final game, on Sunday night, will see a first-time world champion crowned when either the Spanish or Dutch claim the World Cup. It will be an incredible match at an incredible venue. 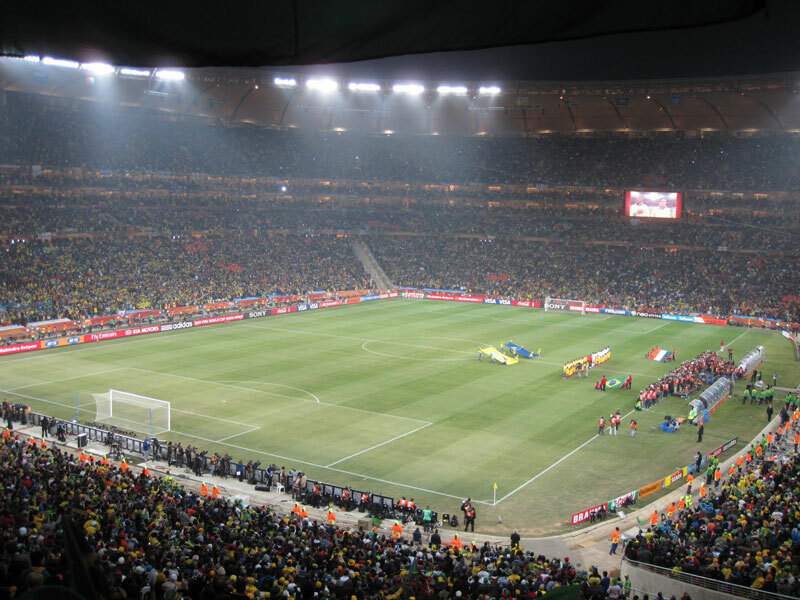 I was fortunate enough to watch World Cup matches at Loftus in Pretoria (39,000 attendance that night), in Cape Town’s Green Point stadium (about 65,000 at each of the matches I watched) and a match at Soccer City between Brazil and the Ivory Coast, where 85,000 people attended (picture right). Cape Town is an amazing setting, certainly the most beautiful location for a stadium in the world, but Soccer City, well, it’s just a breath-taking, hair-on-the-back-of-the-neck-standing-up stadium for its size and atmosphere. If the Cape Town stadium hosts football matches, then Soccer City hosts gladiators in conquests, and anyone fortunate enough to be there on Sunday night is in for an unforgettable experience. The match-up between Spain and the Netherlands brings together two of the world’s pedigreed footballing sides, remarkable for the fact that neither has won a World Cup. The Dutch have featured in two finals, during the “total football” days of Rinus Michels and Johan Cruyff in 1974 and 1978. On those occasions, they fell short at the final hurdle. Spain meanwhile, had never even reached a semi-final, despite being home to two of the great club sides in world football (Barcelona and Madrid), and despite producing some of its great players. The Spanish have been solid and compact this year – they’ve only conceded two goals, the fewest in the competition, but have been less than incisive and spectacular at the other end of the pitch. David Villa is their big threat, with 5 of their 7 goals to date. However, as they have shown before, they have the ability to score from anywhere and a player in Fernando Torres who is only a second away from a return to goal-scoring form. He may come off the bench, but it may be with impact. If Vicente del Bosque chooses to stick with Pedro in his starting 11, it gives Spain more width and incision. And with seven of the starting line-up likely to come from Barcelona, they have understanding too. The Dutch have been professional and clinical, and with on-form players everywhere, as well as two match-winners in Robben and Sneijder, they will be difficult to contain. As has been the case all tournament, a lot will depend on who controls the midfield, which is a function of players, space and press. Spain’s pressing against Germany was brilliant, and rendered the German midfield largely anonymous by denying them space and time on the ball. However, an interesting stat that I came across is that 47% of Holland’s passes have been inside their own half, the lowest of the tournament, and a sign that they are happy to play deep and patiently. The technical analysis of the match is of course a fascinating area for me, and while I have more thoughts on how this match will unfold, I think it best to defer to what I think is the best site for football analysis that I’ve ever read. In fact, I’d go so far as to say that this website is the best sports analysis site I have read, because it is accurate, technically detailed, but somehow retains simplicity at the same time, which is a rare combination. I have friends who know little of the sport, but they are ‘experts’ in five minutes having read this. The mark of great thinking is to take the complex and simplify it to make yourself look simple! And this website does it brilliantly. It’s called Zonal Marking, and you can check it out here. For an example of a brilliant post-game analysis, check out this post analyzing the German demolition of Argentina. The comments are equally informative and high in quality. And check in over the next day or two for his preview of the Spain v Holland final – the previews are accurate and they’ll certainly enhance your appreciation of the match. The other factor that I do think may have a bearing is the altitude. The only reason I point this out is because I noted today that Spain have played half of their six matches at altitude, whereas the Dutch have played at altitude only once. That match was their 2-1 win over Denmark, and after the game, both teams really complained about the altitude. The Dutch were quoted as saying that they struggled, both with breathing (dry mouth, shortness of breath) and the flight of the ball. Of course, that match was three weeks ago, and they’ve had time to adapt, but I do think it is relevant that they’ve played five matches at sea-level since that, whereas Spain have played three at altitude over the same period. Purely in terms of familiarity, this could become important. I’m not sure where the Dutch have been based between games – their base was in Johannesburg, but teams travel to match venues up to 3 days before kick off, so it is possible that they’ve spent maybe 5 days out of 27 at altitude, compared to 20 for Spain. I posted earlier in the week that the altitude is certainly having an effect on the tempo of the matches, lowering total distance, high intensity distance and the number of sprints completed by each team, and I do feel that a crucial part of improving performance at altitude is learning how to pace the efforts. And I believe Spain has an edge in this regard. So for a bit of fun and because we’re fans after all, I figure why not whip out the Science of Sport’s crystal ball and throw out a prediction. A tight game, as finals always are, will produce a goalless first half. Spain will control possession, by pressing up on Holland, whereas Holland will be content to sit deep and rely on Kuyt and Robben to find space wide. So 0-0 at half-time, but Spain to score in the second half, with maybe 25 minutes to play. Then Holland will throw players forward and be exposed in defence, and the final score will be 2-0 to Spain. Torres to seal the win with a counter-attack goal at the 84 minute mark. The Dutch will simply lack the sharpness at the end as a result of the altitude and Spain’s relentless control of space and possession! Also, I believe the experience counts for a great deal and given that Spain played in and won a 2008 Euro final with many of the same players, their familiarity will help them through. And that’s the crystal ball. Don’t worry, it’s hardly ever correct, except for once in the London Marathon! Whatever happens, let’s hope for an open, positive and fair match, where the best team wins without the controversy and bad-taste of previous finals. And please, no penalties! 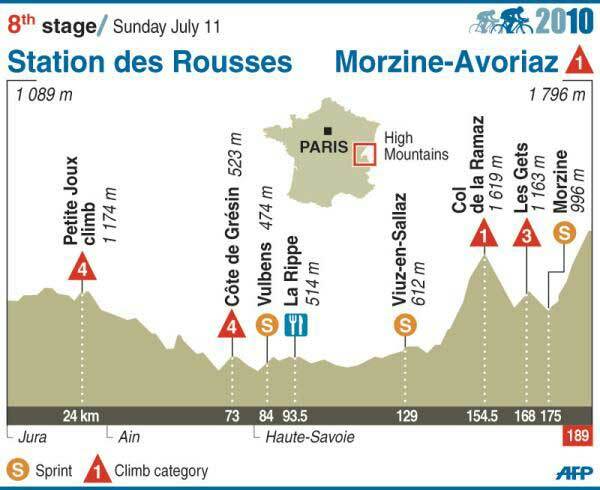 With such a mountainous Tour still to come in the Pyrenees, this stage may well not produce the decisive moments in the Tour, but it is the first big rendezvous among the GC contenders. The first week of the Tour produced plenty of nervous moments, eliminated two GC contenders and challenged all the others at various times, but the stage is set for the battle in the mountains. Once the World Cup is finished, this becomes our big focus, so tune in for some thoughts next week! Enjoy the World Cup final!